Whenever a cruise line introduces a new class of ships, it’s easy to forget about the great ships they already have. Last year, during the fanfare of the Edge class announcements, Celebrity Cruise Lines unveiled Celebrity Revolution. Now the scale of this $500 million fleet upgrade program has become more clear, and we're even more excited. Ric and Billy discuss what is ahead for the Celebrity fleet. If you're anything like us you excitedly follow the news as Cruise Lines announce new ships with new features and venue it's important to remember however that cruise lines have other ships that still offer fantastic experiences and every so often cruise lines will revitalize their existing fleet Celebrity Cruise Lines has decided to commit five hundred million dollars to bring edge class features back to the millennium and solstice class of ships they're calling this celebrity revolution and that's the topic of today's cruise have a podcast. You're about to set sail on the cruise have a podcast and will be avoided through the will of ship's pullets and beyond welcome a boat I want to thank you for tuning into the very first episode of the cruise have a podcast this podcast is a companion to cruise have a dot com where you can read recognize ramblings Rance opinion pieces history reviews all sorts of things anything we find exciting that's happening in the world of cruising So thank you so much for tuning in and at the end of the show you'll hear how you can get involved on social media as well as the website. I think in any story it's important to understand the little bit about the origin of a cruise line and celebrity while they are part of Royal Caribbean now they actually started out as an independent line a great company in fact if you're familiar with the signature acts on the stacks on Celebrity ships and they they put it all over their branding like in the accelerate and other things with their wireless Internet. That letter X. is the Greek letter cause I which is the first letter if you're spelling Chandra's group in Greek so that's where the branding of the X. comes from one of the logos or tag lines I guess that celebrity's been using as modern luxury lives here and I've got to say from my experience that is something that they're. French dates the line from all others one of the other odd things about celebrity is that they're flagged in Malta rather than in the Bahamas and that's had some consequences for what they're able to do with their businesses that other lines aren't able to do. It's also important to note that celebrity while we think of I usually think of it I think Rick to their larger ships you know the millennium class ships Olson's class ships and now edge they have another part of their fleet for a long time they've had we start out which is one and now they're up to I believe four ships in that are in the Galapagos and they range from sixteen passengers to I want to say somewhere around fifty passengers or so that's the celebrity expedition the experience of flora and. Well I don't know I don't usually investigate this part of the line because it's a well out of my price range Agreed but if anyone has Please let us know what it was like and take us next on yeah I've been great so as we said celebrity is now a part of the Royal Caribbean family it merged with Royal Caribbean in one thousand nine hundred seven and that's what changed Royal Caribbean Royal Caribbean International into Royal Caribbean Cruises on the tip of and one of things that brought celebrity into the world when family is they cater to a different audience I don't want to say that no kids go on Celebrity they definitely have a kids program but it's not typically families that are going it's usually adults. When we get into Season twelve and talk about the mergers and acquisitions of cruising that's up to ninety six Yeah so you know Mark your calendars everyone. Been actually look to purchase a different cruise line for the premium part of the market and it's one that I'm sure will talk about the future so little teacher and so but one of the things that celebrity is known for is they're embracing diversity they have the first female C.E.O. of a cruise line traded on the New York Stock Exchange that's really salute off her go a she. He has been with celebrity for a very long time they also have great support for the L G B T community and they've had two annual pride parties at sea so far and I'm sure they'll go on to do a third yet really important stuff there and it seems to resonate well with with guests which beyond the humanitarian part of things is also important that you relate with your audience so they've got two primary classes of ships right now the millennium class ships which include constellation infinity millennium and Summit and BILLION I have been on the celebrity constellation had a great cruise on that ship fantastic I also remember my very first Celebrity cruises on the century so that was there of the previous class of ship missed out a lot no longer in the fleet Yeah one can dream one can dream but then there's the Soltis class ships which include eclipse economics silhouette Soltis and reflection and Rick you've been on reflection I've been on reflection you can look at a live blog of that that I've posted here on the site and had a great time got to interview the hotel director of that ship while I was on it and the events coordinator That's right yeah that that made me very jealous the photos from that BET is an appropriate response so let's talk about what's going on right now with celebrity I mention the floor which is the newest one of their small ship. Vessels that one's going to be all suites which is pretty exciting for a ship to cater to that level it's going to be the largest of the ships that they've got going to the Galapagos fifty state rooms double occupancy in all of them So hundred passengers biggest one for and it's purpose built for the Galapagos hundred passengers and it is way bigger than the others in fact yes. But pretty cool again be sure to invite us also going on they have the the celebrity edge celebrity apex of the edge class of ships is the newest and if you've gone to cruise have a dot com You've seen us right about this we're really excited what's our countdown seventy. Before days as of this recording really excited to go on edge we've got a couple of those cruise books to keep keep an eye out and then there's a celebrity revolution where we came here to talk about today so. The so many things on the edge were so well received even before they were this deal was cut that celebrity said you know what we need to make sure that these great features these great venues and a lot of the design cues beyond just the actual you know tangible things went over to the other vessels in the fleet so there's time that somebody has done this before when celebrity introduced the solstice class of ships they had some new features too they had a long club which is an open grassy area in the ship a glass workshop that was coordinated with Dale truly and a new restaurant called Q Zeen that was very innovative small plates and they've decided to take some of that to the other ships there a program they called Souls to size and I do want to mention because I know we have a lot of listeners Well I don't know if we have any listeners actually yet but I know we will have a lot of listeners that are very familiar with Caribbean cuisine I would say to give everyone an idea is somewhat analogous to Wonderland I would say it's the celebrity answer to Wonderland It's similar but different in some very important ways and just as a personal preference I had a much better make look easy I think will have to do more research my stomach as well. So the souls to size and program be game began under the former C.E.O. of Celebrity Cruises and that started around two thousand and ten continued for a couple years after that at the time the current C.E.O. of the company Lisa Lou talked Pirlo she was serving as the senior vice president of hotel operations so there's anything to be confident about with the celebrity revolution project it's that the current C.E.O. has done something like this before and that's important when when you're talking about this much money and changing a fleet of ships that people love. You but clearly we're not we're not alone at least in this we are not alone so sold the project where they sold the sized It's hard to say all of their. Rolls right off the tongue that was a one hundred forty million dollars project when they announced celebrity revolution last year they initially said that it was going to be a four hundred million dollars project that's a big increase over one hundred forty million and I'm pretty sure that exceeds the rate of inflation Oh definitely so and now they're actually saying that it's going to be five hundred million. Dollar so I don't know who's in trouble for the twenty percent budget overrun in the course of a year but probably good good things for us though you know I'm going to take a lesson ical take on this that it was a budget overrun although that is probably true from a managerial perspective I'm going to say they discovered some new things they could add and allocated additional funding based on guest feedback yeah let's say that. So one of the things that I'm looking forward to seeing on this ship is the or on through the soles to size No not the smallest of size and project we're talking about celebrity revolution in the celebrity revolution project is the sweet upgrades that are coming from Kelly Hoppen she is a well known globally known designer if you happen to catch the absolutely fabulous movie she's got a cameo in that so she's much more well known in the British and Australian wild but I did not know about her cameo I want to go check that out she's a big fan at that well it's it's brief as the as cameo implies but she's done it and she's done some great work on designing the suites and some of the spaces in the celebrity edge and so I'm really interested to see what she's going to bring to this every revolution I think one of the things that I'm most excited about is maybe ironic because I don't generally book sweets I I've written a couple times about how I select what type of state room I'm going to be on and on a cruise and you know it's nice to have a really nice room but it really comes down to value for me and that in mind the sweet redesigns that are happening with celebrity revolution look really cool because it's not just about the rooms yes the rooms themselves are getting some pretty major upgrades but there's the retreat Sunday in the retreat lounge Those are our features that are again borrowed from edge and if you if you sailed celebrity before you might be familiar with Michael's club that's going to become the retreat lounge these seem to be modernizing that venue somewhat. Very popular Heidi a rather classic feel that I don't think is very nice I don't think it's in line with the image celebrity is looking for today yet I think Michael's Michael's club from what I saw when I was on the reflection I wasn't granted access to it but just what I could see through the door yes it kind of harkens back to an older time in cruising which is great and some people do want that for their careers experience that's just not what celebrities go in for these days Yeah absolutely so I'm confident they'll make that transition without without making guest feel abandoned they did like that feeling because it was a very nice venue. Some of the other things that are happening are the state rooms are all being updated now the architectural firm that's been hired for this is Hearst bed nurse So see it's any relation. Not that I'm aware of but maybe we can just edit this part out in case I'm you know gazing at a piece of this OK I'm sure that's a big ticket. I mean the last names match up all right so no one's going to hear that because it would sound like were conspiring. So one of the things that they're adding across the fleet now is the R F I D locks this really appeals to me because the one issue I had on celebrity reflection was that right Mikey died probably three times a day and I was told Don't keep it near your phone well I know I don't keep your my phone but it are F.I.D. key is just a far superior technology beyond Rick's experience where I recall you got very friendly with guest services but that's not how I would describe myself. Mr Ross coming for another key. So one thing that I think it's important we should point out with the our if I do lock some some guests some listeners maybe think I don't really care about new technology to open my door first of all you will likely see this type of thing optional it's not like oh your phone battery died you can't get in your room but what makes this important. Part of the experience is cruise lines especially celebrity and enroll Caribbean have been looking to streamline experiences and right now on some of the new row Caribbean ships for example you'll be able to do this on edges wealth the check in process is really really efficient you can check in on your phone take your own picture it displays like a boarding pass just like a mobile app might for an airline and you go up to the to the port agent they scan that make sure everything's good and wave you on but right now you then have to pick up your room key your room so imagine if like all Disney World Yes you don't even need to do that you check in you can go to your room you didn't really need to grab any keys or interact with anyone too much so I think that's important just for making things seamless and will help with families and and the card to Mag zation Yes And just for the less technically savvy who may not have all of that I think the gist of what Bill is saying is use your phone as your room keys and nothing you already have and there are if ID locks enabled that beyond just having an R a five card it what we don't know is if we'll see that functionality even on edge right at the beginning it made a great because the other thing that that technology is used for our response which we see on M.S.C. 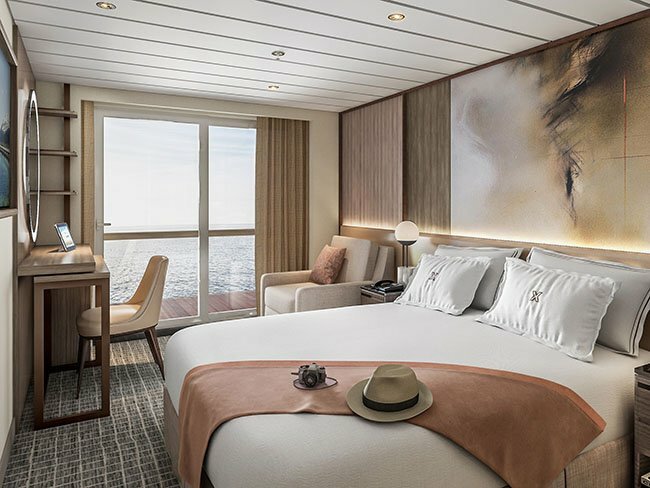 seaside and we see on several world Caribbean ship so it'll be interesting to see how they they roll that out but ultimately I think it's an important thing almost as important as getting a good night's rest vs the bedding is being upgraded across all the all the ships. And that's important for some people listen it's important to me personally because maybe it's just a it was a princess in the P. Yeah this situation but Royal Caribbean a couple years ago started changing out some of the beds and it was a problem for me and I expressed my concerns many times celebrity has traditionally I've been pretty OK with their betting Oceana's mattresses side you have paid for it. That is very true but yes the the new bedding includes It's all cashmere high thread count Gyptian linens going to be going to be cool stuff yet you won't be staying in a two star hotel when you're in a renovated room on a British ship I tend to sleep more than Rick does on cruises so I'm going to be testing this fully That's not true I just sleep at different times than Billy's sleeps so I am awake when he is asleep than when I am asleep when he's awake he thinks I'm sleeping Additionally but I'm not it's like we didn't live in different times and that's. One of the so we talked about Q.C. is one of the great restaurants that came out of the solstice salon and soul cuisine is now going to be on all ships I'm unclear on exactly what form fusing is going to take there are some things that make it sound like it's going to change a lot some things that don't mention that at all but Q Zeen as a will be present on all ships and Rick you've experienced accusing So tell me if this is accurate or not I'd mention the comparison to Wonderland I think the reason I compared because that it seems like it's about experience will dying it's not just about but who do you know yes you're eating food yes they wanted to taste good. But it's it's about presentation it's about new new ways of making maybe foods that you've had before you know whether it's deconstructions and things like that and that's I think that's something that's neat especially let's be honest cruising is a business you know signs love you want to pay for specialty dining right so offering something that's beyond just well I like my meal in the main dining room and they hope you do offering truly a unique experience is I think something we're going to see more and more and there's actually some of that coming that we'll talk about with the chaff Yeah I think this is some activity dining activity I guess that's going to be going on with in Q scene and I think it fits very well because as you said like there's a different focus in Q.C. and some of that is. Being fine being a whimsical having That's what the dining experiences is it's fun and so they're introducing something called the teach Chef where they've partnered with a company that does three dimensional projection mapping. And then let's do we know about this. There are a lot of details out there well let me let me start by saying that I suspect in a matter of a year or two we're just going to refuse to have any food on board that doesn't involve three D. projection mapping is that is that yes I mean. If you can do it why not and if you can do it why am I not getting so basically I think augmented reality where there's almost you can think of virtual show with your meal being prepared there hasn't been a lot of show and I know some people were lucky enough to experience a kind of simulation of this when celebrity did a tour of the country that I think actually was only a few places. And it allowed us to to shoot to experience as it gets back to that experience will dining kind of thing is something I know guests are really excited for on edge we'll see how that plays out so they decided they were going to go ahead make the investment and try this out across the fleet Yeah I think the essential of the story that I've seen is an animated chef assembles your meal on the plate in front of you. I I prefer I love zucchini if I could have animated zucchini I can only imagine that it would be weird I think there's a children's cartoon that's about the animated zucchini Veggie Tales. Veggie veggie fruit fruit no that's Disney and that's wrong sadly sadly long gone so while we're on the subject of dining the subway revolution is going to include refreshing the main dining rooms which I thought were great on the on the Constellation I thought they were great on the reflection. But they. I've got a new idea and I'm excited to see it I suspect that what we're going to see is in when you look at the renderings and artistry from. You see that a lot of the colors are very different palette than we've seen across the liberty and I think to some extent they're looking at venues like the main dining room is going OK we need to at least adjust the palette even if maybe the style of the decor is still in line I think that's what we're probably seeing and listen I likes a little celebrity main dining rooms if if perhaps all the whimsy you need in your meal is is my accompaniment the now that's a great place to be so it's and it's now it's not just the main dining rooms that are getting a refresh the Ocean View Cafe which is right which is celebrities on board Buffet is going to be redesigned to something we've seen go on on other cruise lines where it's pod bay store there are areas that are focused on different cuisines and this breaks up the there's a line of people to get one eye to get all the different items I want the fifth item and no one's actually there but I kind of have to wait in this line this is going to break that up and make that experience hopefully full a lot nicer and what I think it will it certainly has worked for a lot of ships and lines and it really should make it pretty seamless because celebrity already has a very different passenger space ratio than a lot of mass market lines in the contemporary lines so even on consolation for example I didn't feel like I was queued up like like on embarkation day on some other ships were just a mad house but this will certainly help I do wonder where they have played a little window washers to the you know in the millennium class ships you can look down from the ocean yes that was such a nice touch so nice but always dirty because how do you clean that you know. What Speaking of keeping things clean one of the things I expect that we will see is the installation of handwashing stations at the entrance or in the lobby the first time I saw this was when I was on Royal Caribbean's Empress of the Seas and just a great idea it's one thing to put some sanitizer on your hands another thing to fully wash and dry your hands and I just I like that opportunity to be able to wash my hands without going into a bathroom and then having to touch something to get out of the bathroom and I also like the ability to wash my hands on the way out of the restaurant if I wish yes totally agree I know you would like that part of. The washing on the way out as well yeah I don't I don't want it with dirty hands and I don't have my hands dirty. Yes on harmony of the Seas I love that you pretty much have to bump into sinks to enter the Windjammer which is the ferry on Royal Caribbean ships that it's not just those things are available like you look like a jerk if you're not washing your hands at that point emperor because structured about the same way fewer sinks Marron are not like that plenty of things available but if you want to breeze on through it's unfortunately still possible Interesting I didn't know that well that's that is new but so now I have a feeling we are going to see hand washing stations on. Every revolution across the line Nothing beats thorough and frequent hand washing and. Even between hand washes though you can always use one of the only hand sanitizers guaranteed OK never mind that would be germ star Noro please feel free to find it on the crews have a dot com shop. Now it doesn't count because Rick plugged in so I didn't say all right there so I doubtless there are other details that have not been revealed and will first start seeing this in twenty one thousand first ship to be put through the celebrity Revolution program will be the millennium that's one of the smaller class of ships I meant I'm also interested to see how does the same redesign principle apply to the two different sizes of ship it'll also be interesting to see I mean that's pretty ambitious that they're looking to complete this on Millennium by February of two thousand and nineteen what makes it really remarkable is there is not a. No one step foot on edge yet right so a lot of these things that they think are great and that guests have said we're excited about this we can't wait to sell edge and check this out we haven't really been proven if you look throughout through cruising history when a cruise line releases a ship and it's the first in a in a fleet or in the first in a class of ships the second one always has some changes that no one could have predict. The need for necessarily but that as soon as somebody stepped on that first completed checkpoint OK This needs to be different this is going to work this could be better something like that so because these changes being made ahead of edges launch it'll be interesting to see. How much of a scramble there is on Millennium. And frankly if the next in the fleet which I think is going to be Summit in toward the end of March also one of the smaller shops right there will be differences in the way that they apply this from from millennium to summit and then afterwards it gets to economics which would be the very first of the solstice class ships to get this treatment Now one thing that may give celebrity more confidence about where they want to go with the celebrity revolution is their virtual reality center that they have so they have they have have they have a more ability to mark out and be in the space than they've ever had before and that may give them as an increased amount of confidence it's true and they have that confidence from of course the designers and employees being able to experience it but as as I look to earlier also in some cases from guests when they've done these you know little P.R. tours and stuff it's very cool in this is the first ship that's been completely designed to edge is the first ship that's been completely designed in this way so that everything can be can be seen in virtual reality I'm sure they're applying the same concepts to to celebrity revolution Oh I'm sure I'd be hard to imagine if they had this great technology and and did not take advantage of it I mean sightlines alone you know it's something that you just couldn't do otherwise you know Disney is famous for for taking into account all these little details and sightlines they still hang you know big balloons places just to figure that out so being able to virtualize all these things I think will will help really make sure that the guest experience is as it's intended to be yes so we're looking forward to seeing what happens on the millennium as it gets announced or as it gets revealed rather a. Beginning of February twenty ninth teen also looking to see for comparison what the edge is like and again will be sailing on that ship December sixth and then you've got another sailing coming up and then world need to plan something for one of the. Revolutionized Celebrity ships I'm don't know that they want to call them but if that sounds dramatic dramatic that is B.S. So well I think maybe after we we hit stop on this recording we're going to have to look at some sailings on some other celebrity ships coming up soon that sounds like a good plan and after we've finished recording go ahead and check out our website Cruise habit dot com We've got an article that Billy wrote about the celebrity revolution you'll get to see some pictures there that we can provide an audio podcast and while you're there check out some other articles if you've got questions about cruising send us an e-mail if you'd like to get in touch with us about this podcast or e-mail is pod cast at cruise habit dot com I'm Rick Ross and I'm Billy Hirsch thanks for listening. I this is Brandon tabby coming to you live from the boardwalk on Royal Caribbean's Oasis of the Seas we're friends of hers have a dot com You can follow the guys on Twitter Instagram and Facebook and you can also subscribe to the crews have a podcast on i Tunes Google Play or wherever you get your podcast search crews have it in the periscope back to join the broadcast from ship and shore the guys would love to talk ship with you real soon.